Markets are weaker this morning after a terrorist attack in Brussels leaves 35 dead. Bonds and MBS are up. 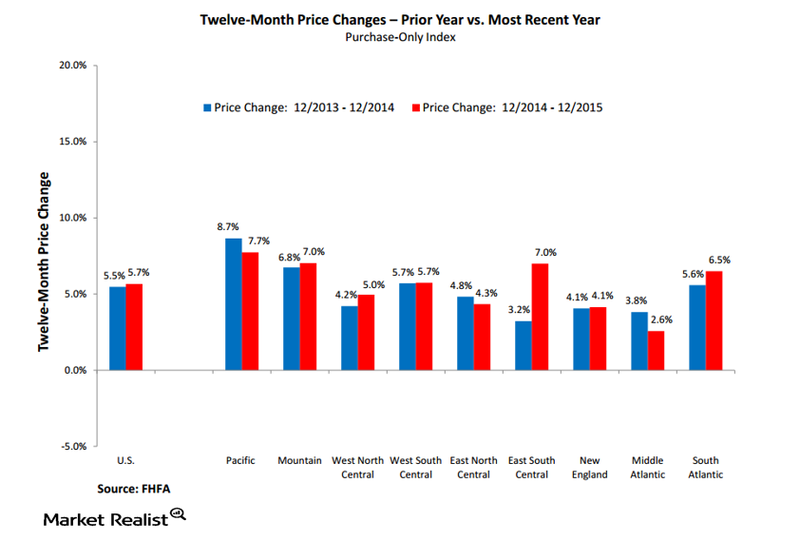 The FHFA House Price Index rose 0.5% last month. House prices have recouped all of their losses from the housing bust and are making new highs. Note the FHFA House Price Index is the only one showing the losses have been recouped – Case Shiller, and Core Logic have not. You can also see the huge geographic disparity between the different regions in the US. The Northeast (which includes New England and the Middle Atlantic) are picking up the rear compared to the other parts of the country. As someone who grew up in the Rust Belt, I am beginning to notice similarities in the Northeast. In other economic data, the Richmond Fed Manufacturing Index improved last month, and the Markit US Manufacturing PMI was flat. We are well aware there is a problem with the first time homebuyer. They are saddled with large student loan debt, and are under-employed for the most part. The other big issue – low housing inventory is making the starter home unaffordable. When you look at the expensive areas, it gets ridiculous. 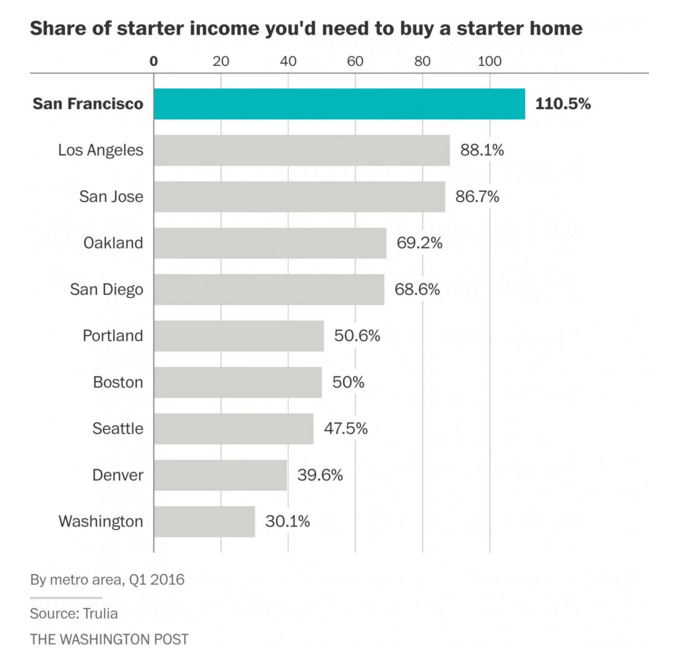 The mortgage payment for a starter home in San Francisco (admittedly an extreme example) would run someone 110% of median income! I have said it before: the difference between 2% GDP growth and 3% GDP growth is housing. To address the dearth of inventory, we should have a run rate of 2 million starts a year. Yet we remain mired around 1.2 million. It obviously isn’t an oversupply issue – it is a credit issue. Yet the consensus seems to be that the financial sector remains “unregulated” and needs to be reined in. You would think politicians would like to see 3% economic growth but apparently they don’t. All obama seems to care about is racial bean-counting in the burbs..
Over half of US homes are now built in community associations. Issues over the creditor priority HOA claims over mortgages have been an issue in some states, apparently. More evidence that the cheap labor arbitrage for China is about over. The NYT nailed it on Trump a while back. I’m not racist. I hate everybody! Here, you are all equally worthless. Wonder if they tortured him? If they didn’t, it would have been a good idea, no? Don’t you remember? Torture never works. Even when it does. It seems the lefties were out in force yesterday trying to draw an equivalence between Obama and Reagan.